International Women’s Day…so much love! International Women’s Day (IWD) was honored the first time in Austria, Denmark, Germany and Switzerland on 19 March 1911. More than one million women and men attended IWD rallies campaigning for women’s rights to work, vote, be trained, to hold public office and end discrimination. In 1975, during International Women’s Year, the United Nations began celebrating 8 March as International Women’s Day. This year, for the centenary, the theme for IWD is “pathway to decent work for women.” That means equal access to education, training, and science and technology. So I challenge you to get out there this month — also Women’s History Month in the US — to celebrate and advocate for the amazing women in your lives! The day started with the 3Б class singing to the teachers at our morning meeting and wishing the women love, happiness, and health (these are standard wishes on any special occasion in Ukraine). Adorable. 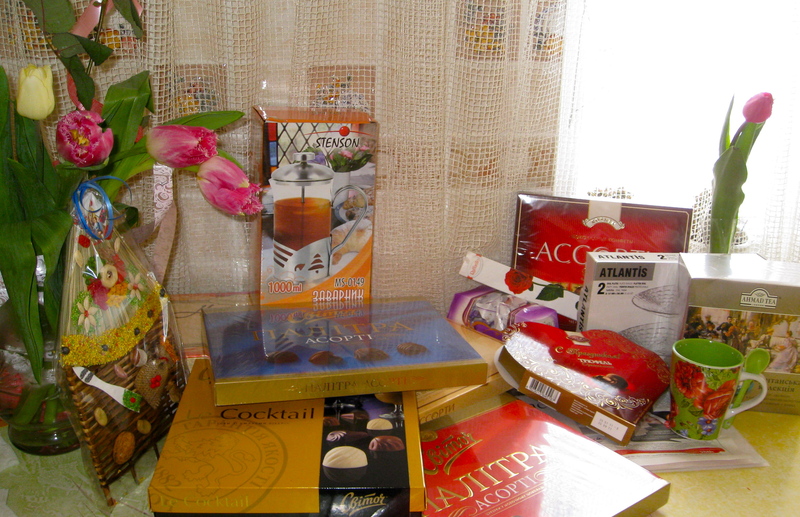 I had received a box of chocolates and jar of instant coffee from my 2Б class — well, their parents — on Thursday, so I expected maybe a few more boxes of chocolate from the three classes I had on Friday. NOT SO. Throughout the morning, as I sat in my classroom, pupils came in — sometimes just a pair of them, sometimes the whole class — to give me a gift and wish me love, happiness, and health many times. In between these visits all I could do was sit and chuckle to myself at the wonderfulness of it all. I felt so much love from all my pupils! If love/appreciation could be measured in gifts, the grand total for me would be: 8 boxes of chocolate, 8 flowers (total), two coffee/tea mugs/spoons, two boxes of tea, a French press (! ), two glass plates, and a Ukrainian handicraft to keep away evil. WOW. After the bombardment with material items, the afternoon and evening were devoted to celebrating women even more. At 2pm the “Міс Школи” (“Miss Shkoly,” aka “Miss of the School”) competition began. This happens every year in the 9th-11th forms, and it’s a beauty/talent/intelligence contest. Five of the eight contestants are my pupils, so that made it even more fun. The contests were as follows: introduction, Ukrainian traditional dress, talent/hobby, homemade dress, evening gown/waltz. One of my 11th-formers, Ilona, won — she designs clothes so basically blew the others out of the water with her talent/hobby — three of my other (gorgeous) 11th formers modeled her fashions while she talked about them. One of my 9th-formers, Christina — the school’s go-to singer — got second place. But the day wasn’t over! Last on the agenda was the teachers’ party, filled with food, drink (for some), dancing, singing, etc. Similar to the New Years’ party with little funny contests and many toasts — this time from the men to the women! — throughout the evening. I finally got home at 9pm, stuffed with food but filled with happiness and good feelings. This entry was posted in celebrations/holidays, community, culture, pictures on 05.03.2011 by taplatt.